Den typiske mallorcanske hus med stenvægge, træbjælker nyrenoverede swimmingpool og privat have med solarium udstyret med hængekøjer. Den store have med græsplæne, store palmer og hjemmehørende træer, er en oase af ro og en fryd for øjet, den overdækkede veranda med udsigt over poolen er perfekt indrettet til at nyde i sommer måltider tilberedt i hjemmet køkkenet eller udendørs grill. Den rummelige stue er udstyret med satellit-tv, DVD, musik-afspiller, gratis internet og andre faciliteter til at gøre dig føle sig hjemme. Opholdet har tre soveværelser og to badeværelser, steder at være besøg Pollença: Strande: Cala Boca, Cala Murta, Cala Sant Vicens, Formentor strand. Steder af interesse turisme og kulturel: Monte Calvario, El Puig, Puente Romano, Det Santo Domingo, søndag marked. ideal para desconectar,en pareja solo o en familia. 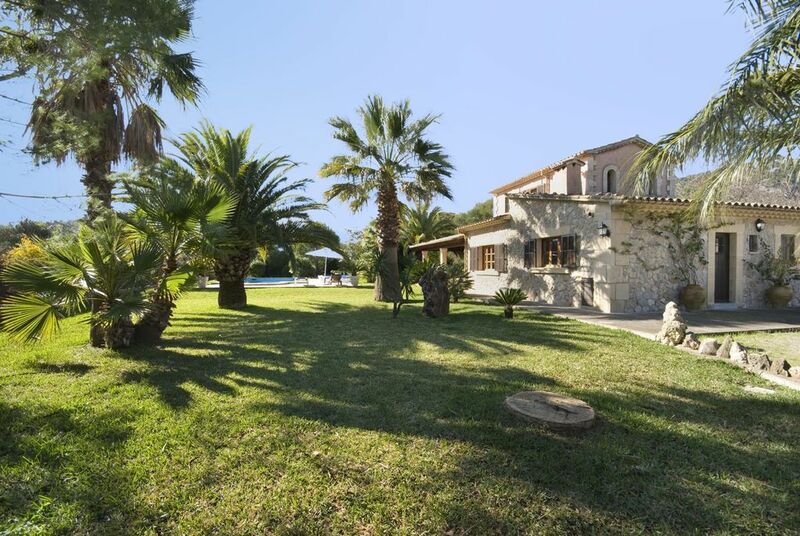 Una casa enclavada en una bonita zona de Mallorca lo tiene todo senderismo ,mar y el puerto de Pollensa.la casa es magnifica muy amplia con todo lo necesario para que tu estancia sea de lujo.Un gran jardín con una bonita piscina un porche magnifico donde comer cenar y pasar un buen rato,en general un de diez .gracias Rosa por dejarnos compartir tu propiedad.Amenazamos con repetir un saludo. Beautiful house, gardens and pool. Perfect location. Very well appointed too. Highly recommended. The grounds and exterior of the property were amazing. Lovely Mallorca style villa with good facilities lots of nice touches to give a really homely feel. Beatiful shady terrace with lots of comfy seating. Sunbeds very comfortable. We appreciated the milk,juice,water etc in the fridge on arrival.Beware the very narrow approach to the villa -very pleased we had a small hire car! The villa was wonderful but we thought we had booked a 4 bedroom property. Upon arrival we were told the fourth bedroom which has an outside staircase was not included in the price and if we required it there would be an additional charge .Be aware of this as the description at the time of our booking did not mention this. We had to pay additional costs but at a reduced rate taking into consideration the lack of information we had recieved. The details on the website have now been updated but double check if you're looking for 4 bedrooms. Great location ,clean and well presented with lots of quirky art work, maybe time to replace mattresses and dishwasher but fabulous place to stay and within easy walking distance to the Pollensa town. Hammock was great, would recommend to friends and family. Thank you Ms. Lynn for your comments, I regret that he did not realize the website where you made the reservation, it was said very clear that the house is rented, up to 6 people with 3 bedrooms, at a lower price, more than 6 people 4 bedrooms and a higher price. This is a very special villa. The grounds are large and peaceful, it is beautiful inside and out and the garden is tranquil and like a little paradise. We barely left the villa because it was so lovely. The scenery around the villa is also beautiful with the mountains and views of puig de maria. We enjoyed seeing the booted eagles flying overhead. The pictures on the website of this villa do not do it justice. There is a lovely outdoor kitchen, which has a BBQ, sink and outdoor fridge. There are two swings and a full size table tennis set, plus additional toys for outside and the pool (kept in the outdoor utility house). Alongside the driveway is a wonderful fruit garden/orchard, with an abundance of grapes, figs, limes, apples. The layout of the house was perfect for our extended family group. One couple had the upstairs room, accessible by the outside stairs and this worked well. We have stayed in quite a few villas before, but we all agreed that Can Mena is the most beautiful we have ever stayed in. Très jolie maison , avec un jardin très agréable qui permet de bien pouvoir profiter du nord de Majorque. A proximité de plusieurs petits ports agréables pour une promenade le soir. La Finca er en lille paradis, ligger i udkanten af ​​byen omgivet af grønne olivenlunde med udsigt over Serra de Tramontana, Mount Golgata og Puig de Maria og kun 1 km fra det historiske centrum af Pollenca, det er et ideelt sted for alle, der ønsker at nyde naturen og stilheden i naturen kun 5 minutters gang fra landsbyen. Pollença by vartegn og kosmopolitisk,. vugge malere, musikere og digtere, tilbyder de besøgende en bred vifte af turist-og kulturelle attraktioner, Byen er også kendt for sine festivaler af klassisk og traditionel musik, og utallige kunstudstillinger. Søndag formiddag er en fornøjelse at nyde deres traditionelle marked og en givende tur gennem den gamle bydel og har en snack i de mange barer og restauranter omkring byens torv.